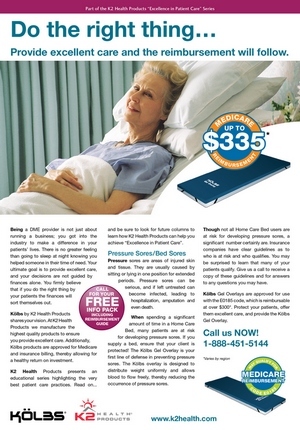 Check out the newest innovation from Kolbs - The Super-Compressed NSR Homecare Mattress! Introducing the Kolbs Gel Overlay! The Kolbs family continues to grow!! We are pleased to announce the newest addition to our product line. The Kolbs Gel Overlay is approved for use with the E0185 code, which offers reimbursement up to $335! In addition, Kolbs is pleased to offer a free "Reimbursement Guide" that will help you determine patient eligibility. Call 1-888-451-5144 today, or simply click on over to our Contact Us Page to request your free copy! Welcome to the BRAND NEW K2Health.com! Welcome to the new home of K2 Health Products! Our new website launched today! K2 HEALTHBLOG, where we will be posting helpful information, new product launches, sales, and more!